The last time a Soldier was killed by enemy aircraft on the battlefield was in 1953, during the Korean War, said Vice Chief of Staff of the Army Gen. James C. McConville. Now, the Army is preparing in earnest for that type of possible scenario against a peer adversary by rebuilding its air defense capabilities, he said, during testimony at a Senate Armed Services Readiness Subcommittee meeting, Feb. 14, 2018. Asked about the Army’s other modernization focus efforts, McConville cited the Army’s six priorities: long-range precision fires, a next-generation combat vehicle, future vertical lift platforms, a mobile and expeditionary Army network, air and missile defense capabilities, and Soldier lethality. Within each of those six priority areas, research and development efforts are focusing on two or three systems that are deemed most relevant to boosting current and future readiness, he said. In the long-range precision fires priority, for instance, the Army is looking at hypersonic weaponry, as well as an extended-tube artillery that will increase range, he said. The science and technology, or S&T, efforts depend on industry investments, along with the Army’s organic capability, he added. 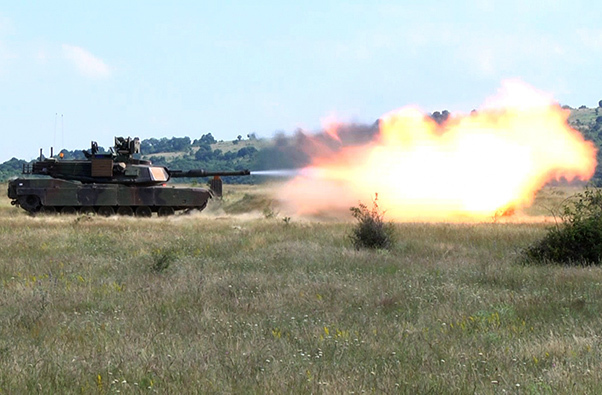 In addition to S&T efforts, the Army’s fiscal year 2019 budget is geared toward weaponry that would be most effective against peer adversaries, including purchase and upgrades of tanks, artillery and attack helicopters, he said. McConville said the ideal deployment-to-dwell time for Soldiers is a 1:2 ratio. Currently, however, that ratio is about 1:1.5, he said. Growth in end-strength will somewhat alleviate that. Furthermore, during dwell time, Soldiers are often conducting home-station training or at a combat training center rotation, leaving them little time for rest and recovery, he noted. During deployments, Soldiers are often training with allies and partners as well, he noted. Assistant Commandant of the Marine Corps Gen. Glenn M. Walters, who also testified, followed on to the vice chief’s comments, adding that the most valuable training against potential peer competitors is taking place with partners in Europe and the Pacific. Soldier and Marine deployments involving counterterrorism missions offer less. Regarding injuries, McConville said the Army is reducing them beginning at the entry level where new physical fitness standards, tests and screenings are being conducted. Since the Army began administering the Occupational Physical Assessment Test a year ago, muscular-skeletal injuries among recruit trainees have been declining. As a follow-on to that, injury reduction measures are being taken at the local unit level, he said. For instance, the 82nd Airborne Division now has dieticians, physical therapists and strength coaches working with Soldiers. McConville said he’s appreciative of the bipartisan budget agreement that will fund Army readiness through fiscal year 2019. However, for the past nine years, a series of continuing resolutions has led to “our inability to start new procurement programs and military construction projects, to enter into multi-year contracts, to increase production rates, or reprogram funds resulted in deferring investments in modernization to maintain support to the ongoing fight.